Lacking or inadequate situation awareness has been identified as one of the primary factors in accidents attributed to human error. Thus, situational awareness is especially important in work domains where the information flow can be quite high and poor decisions may lead to serious consequences. Netarus, founded in 2002, specializes in Visual Aid Technology – first application were sensor integration into web interfaces, progress through custom C4ISR (command and control) applications to establishing commercial off-the-shelf rapidly deployable platforms to eliminate blind spots for tug boats, cranes, trucks and trains. 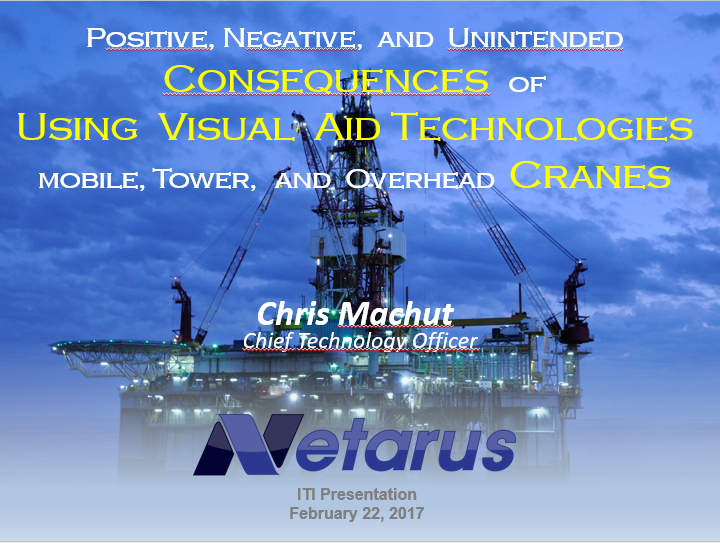 In this webinar with Chris Machut, Founder and Chief Technology Officer, he will share the positive, negative, and unintended consequences of using visual aid technologies for mobile, tower, and overhead cranes. Machut, a graduate of Virginia Tech, is an experienced computer engineer and business developer. Brought to you in part by ITI (Industrial Training Institute) at www.iti.com.